It takes a village (or community) to build a bike network. Recently, communities across the province were recognized for their work in supporting cycling infrastructure and education through the Bicycle Friendly Communities Program. The program recognizes qualifying communities with awards of Bronze, Silver, Gold, Platinum and Diamond for their efforts to increase cycling with the five E’s: Engineering, Education, Encouragement, Enforcement and Evaluation, as well as Planning. 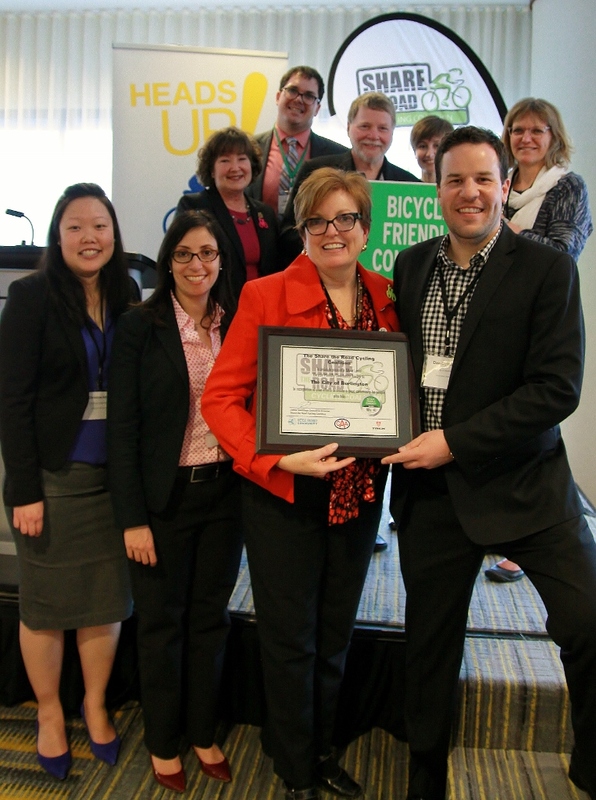 Bicycle Friendly Community award recipients this year were Mississippi Mills, Niagara Falls and Burlington. Launched in 2010 by the Share the Road Cycling Coalition, this year’s awards were handed out at April’s Ontario Bike Summit. We here at dandyhorse looked at five of these Bicycle Friendly Communities (BFC) in Ontario through the eyes of the advocates and advisories working to build them. Thunder Bay went from having no bike lanes in 2009 to now having over 30 kilometres of painted on-street bike lanes and several more will be added this year, with an additional 45km of paved trails within the city. The city received a Bronze designation in 2015. Its achievements include an enhanced cycling education program, an Active Living corridor, Open Streets events, a bike rack program for businesses and the launch of a “you know me, I ride a bike” campaign. “Since the city started this program, there has been a visible increase in the number of cyclists on the roads, and our traffic counts reflect that,” says Adam Krupper, mobility coordinator for the City of Thunder Bay’s engineering division. He’s the municipal staff person who completed the BFC application and leads cycling projects. Political support has also grown. Councillor Andrew Foulds (Current River Ward) has been very supportive of active transportation and has seen some of the best and most exciting new cycling infrastructure get installed in his Ward. "I am very proud that my ward has extensive routes including the flagship, the Arundel Living Corridor, but also very pleased that projects on Algoma Street and Bay Street have improved the connectivity of our city." Peterborough received a Silver designation in 2015. 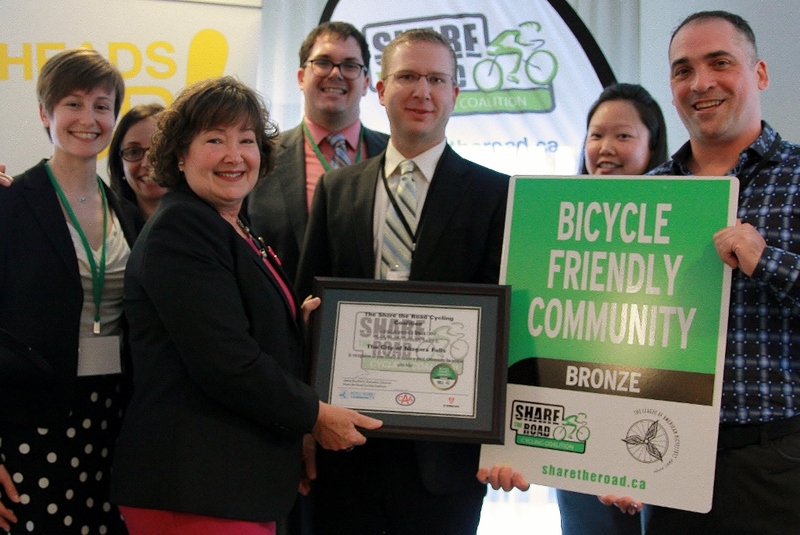 The city was recognized for implementing downtown bike corrals, strong partnerships between the municipality and community, a local bike share network and the launch of the Active Transportation and Health Indicators Report. Peterborough is also moving towards understanding the economic value of bicycle tourism. There are trails up to the village of Lakefield and maps outlining routes of varying lengths from downtown out into the county. “Whether rural or urban, older, younger or in between, the main concern of cyclists and those wanting to ride is connectivity,” says Marilyn Freeman. Freeman is an avid cyclist and vice-chair of the Peterborough Bicycle Advisory Committee, and said she moved to Peterborough almost three years ago because of the cycling. For her part, Lindsay Stroud, credits public engagement for building a strong network. “Community-wide conversations have ensured that a variety of views on cycling are heard through public information sessions, cycling summits, on-line forums, and Open Streets events,” says the coordinator for transportation and urban design programs at GreenUP, an environmental education organization. Hamilton received a Silver designation in 2012. Since then, the city’s achievements have grown to include its SoBi public bike share program, the Cannon Street cycle track and partnerships with law enforcement and public health. The three-kilometre Cannon Cycle Track opened in 2014. It now sees ridership hit approximately 500 trips a day in the summer and 200 trips a day in winter. SoBi Hamilton launched in 2015 and in its first year 9,300 users travelled 450,000 km over 220,000 trips. Jason Farr, Ward 2 councillor in Hamilton, added, “I am always thrilled to get requests for bike racks at private commercial businesses located adjacent to newly installed cycling infrastructure, or infrastructure that soon is to be installed. Windsor’s Bronze designation was renewed in March 2015. Key achievements include that city's cycling advisory committee, a 5.6 km cycle track, strong advocacy and good relationships with the local business community. Success came about through three activities, according to Josette Eugenie, manager of transportation planning at Windsor's public work department. “(We had) consistent council support and allocation of capital funding and resources, annual education and awareness campaigns and successful partnerships with community groups, and collaborating with the MTO on cycling trails." But the award was a surprise to others. “I truly have no clue as to why Windsor would be selected as a Bicycle Friendly Community," says Chris Holt, councillor for Ward 4. "It takes me rather by surprise as any forward momentum in increasing cycling infrastructure is met with skepticism,” he says. His views were echoed by Lori Newton, executive director with Bicycle Friendly Windsor-Essex. "I’m afraid the City of Windsor is not bicycle friendly, although our advocacy group is working hard to change that”, she says. “We have a beautiful 5 km multi-use trail along our riverfront with stunning views of Detroit. We will be opening several more kilometres of the same along the new Herb Gray Parkway in the coming months." Windsor currently has 54 km of bike lanes and more than 128 km of multi-use trails. The County of Essex has 340 km of bike facilities, with plans to add almost 12 km this year. Very soon, there will be a full 100 km cycling loop in Essex County. Ottawa received the province’s first Gold designation in 2013. It was recognized for its include emphasis on data collection, network connectivity, its east-west bikeway (including Ontario’s first downtown separated bikeway and its long-running Bike to Work Month. The Laurier Segregated Bike Lane was a first for Ontario and it was a real achievement to build it, even if only as a pilot project at the time. It was very controversial due to the need to move parking spots, and quite a few Citizens for Safe Cycling (CfSC) volunteers spent a lot of their personal time to face this opposition and make the case move forward. It's been hugely successful, with nearly 2 million rides since the counter was turned on in July 2011. There are current plans to build more in other parts of the city. Recently published cyclist counts in 2015 showed an increase of 44 per cent over 2010, when the counters were initially installed. That gives Ottawa the third fastest rate of growth amongst cities from 17 countries worldwide, also beating out Vancouver, Toronto, and Montreal. “One of the best outreach programs in the city is our annual "lights on bikes" giveaway,"
And the city has locked in funding to complete planned cycling infrastructure projects. “With the significant funding commitments made over the current and previous council terms, we have enough funding to complete the bulk of our ‘Cross-Town Bikeway” network within the central part of the City," says Zlatko Krstulic, senior project manager with Ottawa's transportation planning branch. Read our coverage of the 2016 Bicycle Friendly Community Awards here. Deadline for the 2017 BFC award applications is October 2016. More info here.